First off, I'm sorry you're welcome for that song being stuck in your head for the rest of the day. I just couldn't help myself. Haha! Secondly, it's time for the nail files!! WOOT WOOT! Keeping with the theme of Valentine's Day, this week, I'm sharing a fun, albeit time-consuming mani that incorporates negative space. I've seen some "stained glass" nail art on Pinterest, and figured I'd try it out. Spoiler alert, I LOVE IT. Haha! On naked nails (with a coat of OPI Matte Nail Envy), I used white Rite Stripe to make a border around each nail. Then, I added lines to make differently shaped, stained-glass-y sections, until the nail was full. 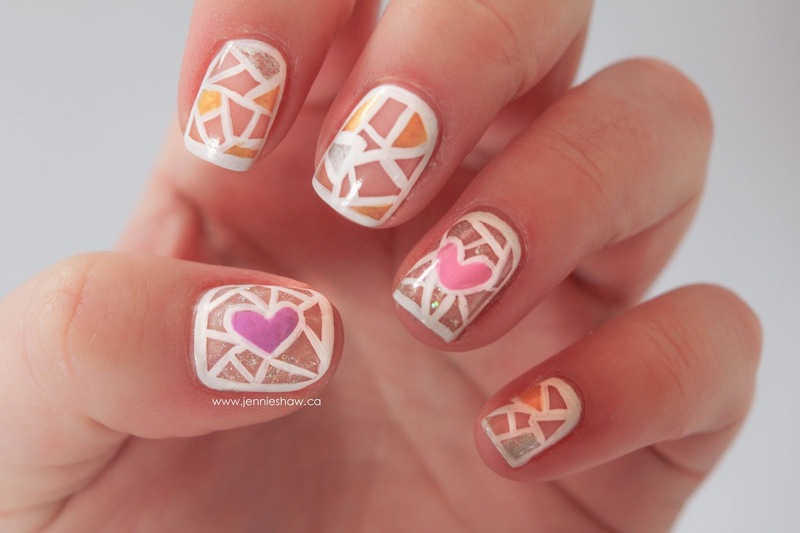 With the feature nails, after the border was done, I added the heart and then filled in the rest of the nail. The best thing about Rite Stripe is that it dries super fast, so by the time I was ready for colour, it was dry. Using a small nail art brush, I filled in each heart, one with Dance Baby and the other with That's Shore Bright. 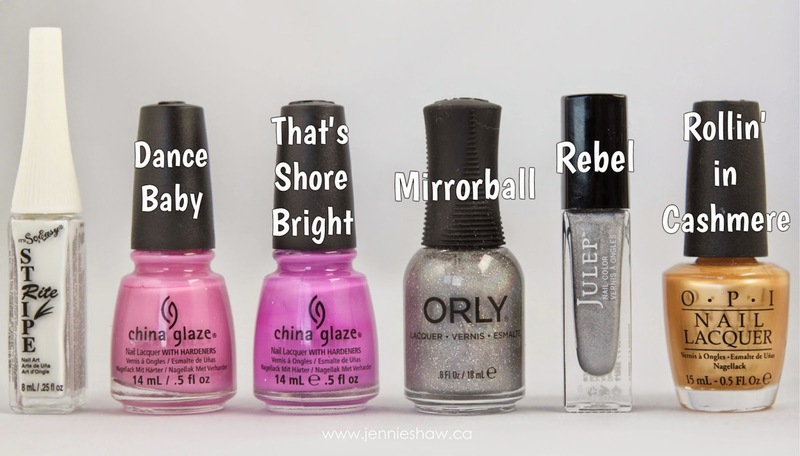 For some sparkle, because it was obviously lacking in that department, haha, I filled in all the surrounding sections with one coat of Mirrorball. Then, with the same brush (but cleaned off, obviously, haha) I filled in a few random sections on my non-feature fingers with Rebel and Rollin' in Cashmere. When all of the sections were dry, I went over all the lines again with Rite Stripe. 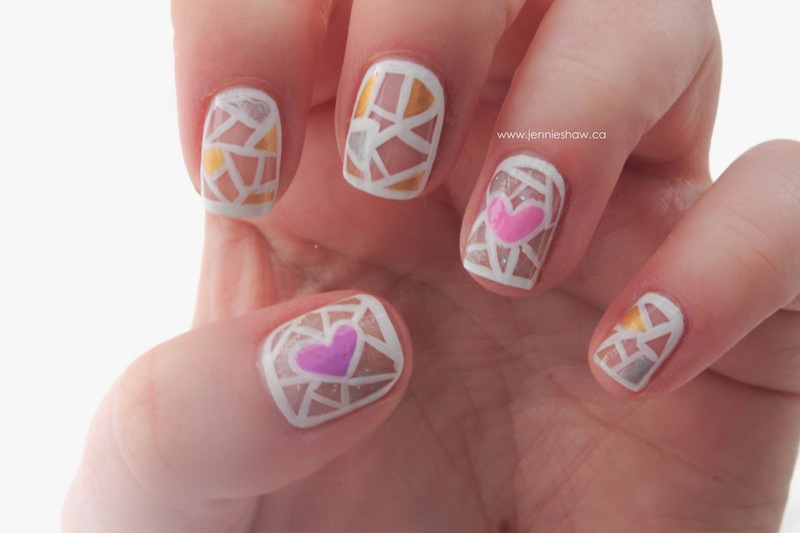 I really love manis that incorporate negative space, and this stained glass effect works so well with it. I love the pops of colour, and how it's totally appropriate for V-day without being super V-day-ish. Definitely a technique that looks way harder than it is! The beauty is that the sections don't have to be even, so you can just wing it. Yay for winging it! And now that I've shared that tip for a stained glass mani, I'm going to pack my things and go. Haha! What did you rock this week? Are you hopping on the Valentine's Day Theme Train, or just doing your own thing? Link up and show off! Are you freaking serious with this? Woman. STOP BEING SO GOOD!!! You're so dang creative...and I can only imagine the amount of patience you have! Way more than I, that's for sure! Absolutely love this--great job! This came out so cool. I just realized that Valentine's day is next weekend, but maybe I'll do 2 mani's before next week. What a super fun design. I need to redo my nails.